The Military-Family: PTSD - "There is a Cure"
PTSD can be cured! One more time: PTSD can be cured! So states Dr Dawson Church, of the Iraq Vets Stress Project. I interviewed Dr Church this morning and as we ended the interview I asked him what single message he would want me to send to our military community and that was it! Of course I am way ahead of this interview, but I was impressed with this program and what he is doing to help our veterans and their families. I had to get that out first! Now I am a skeptic by nature but after talking to Dr Church I came away better informed with data and details on this treatment option. In fact, Walter Reed Army Medical Center is studying the results of treatment and the Project has done two pilot studies with significant results. According to the Dr Church, the scale for PTSD symptoms goes from 17-85 with the average veteran suffering from PTSD at the 63 point level. He said after 6 free treatments the veterans were down to an average of 35 and relatively symptom free after 6 months during follow-ups. According to their study 86% of veterans are responsive to this treatment and it goes across all ages. They have treated Vietnam era vets with similar results as Iraq and Afghanistan vets. In fact, they treated two 80 year old veterans from WW2 who had suffered PTSD for 60+ years with positive results! With 1/3 of Iraq veterans displaying high levels of PTSD, Dr Church explained in some detail the possible biological reasons some suffer while others do not. Biologically, the veterans have high levels of cortisol (a steroid hormone produced by the adrenal gland) which the body provides in response to stress. The fight or flight type of response that needs to be turned off at some point or it can create significant damage. PTSD sufferers have not turned it off and studies are being conducted to see why. Some issues that analysts are looking at include genetic markers in the brain that manage threat assessment and early childhood issues (witnessing violence, lack of stability, etc). He said they are leaning towards including these as possible predisposition factors for PTSD. We shall know more after they begin a gene study in a couple of months to determine additional risk factors. The doctor told me about two disappointments! First, the Veterans Administration has been slow, no crawling is a better word, to explore this method of treatment. 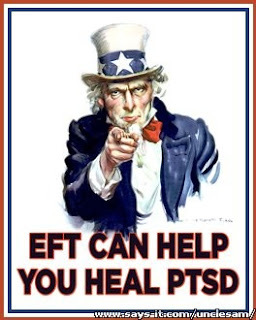 While there are individuals within the VA who use EFT as a volunteer method of treatment the VA has refused to participate in this study and has turned grant studies three years in a row. He described it as a bureaucracy issue requiring dynamite which produced a laugh from this veteran with some exposure to delays while communicating with the VA. The Iraq Vets Stress Project has had now had the opportunity to be expert witnesses at two Congressional hearings on PTSD. In July he testified at the House Veteran Affairs Committee and on Sept 15th spoke at the Homeland Security Committee. He described these efforts as bipartisan with both parties supporting his testimony. His second disappointment was that many veterans do not seek care for PTSD. He described it as a major impact on lives including couples, families and of course the individual. With drug abuse, alcoholism, insomnia, high blood pressure, erectile dysfunction, couple intimacy issues and other problems professional care is critical to PTSD. He told one story of a military spouse bringing her husband to an EFT class for her migraine headaches when her big issue was his PTSD but she knew he would not seek treatment on his own. He said they receive many calls for help from family members but service members are reluctant. He did say that they are getting referrals from the VA and active duty units have even had skype calls to Afghanistan to help with cases there. After watching the video on their website and the response to treatment I would encourage service members, veterans and family members to take a look for themselves! Here is a short video of Dr Church explaining EFT! There is no need to suffer alone! Take care of each other and tell a buddy or a care provider about this program! Again, here is a link to their site or give Deb Tribbey, study coordinator, a call at 707 237 6951 to find an EFT coach near you! Or you can email Deb at deb@soulmedicine.net. Thank you Dr Church for taking the time for this interview and supporting our troops and their families! The Iraq Vets Stress Project is open to Afghanistan veterans as well! The project originally started with Iraq veterans but is inclusive of veterans suffering from PTSD.